The Robeson County Community Foundation is busy presenting 2015 grant checks throughout the community. 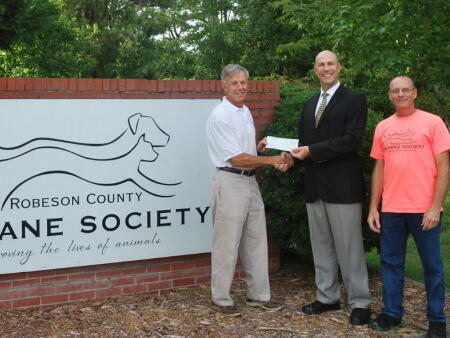 Eric Dent, (center) RCCF board member, personally presented one of the affiliate's contributions from the local grantmaking fund to representatives of the Humane Society of Robeson County: Jason Britt, president of the board (left); and Bill Cerase, executive director. This local chapter of the Humane Society is devoted to improving the lives of animals, a worthy cause! Read more about the local chapter here.